Former Defence Secretary Gotabhaya Rajapaksa has hailed President Maithripala Sirisena’s fiery speech on Wednesday that drew sharp criticism from civil society and opposition political parties and exposed a major rift in the ruling UNF-SLFP coalition. Speaking to the BBC Sinhala Service from China, where he is currently attending a defence summit, the powerful former official in the Rajapaksa Government said he was “happy the President had finally understood the truth” state institutions probing corruption allegations. 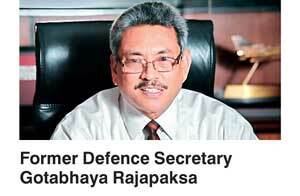 Denying that he had spoken with Sirisena before the President’s outburst earlier this week, the former Defence Secretary vowed that there was no ‘secret pact’ between the current President and the former ruling family. In a widely publicized speech on Wednesday, President Sirisena railed against the three main anti-corruption bodies of the Government and criticised the Bribery Commission for ‘hauling’ former military officials including Gotabhaya Rajapaksa to court. He said over two years they had been making it clear that corruption probes conducted by the anti-graft bodies were politically motivated. “Now President Sirisena is giving the same explanation of these investigations,” Rajapaksa asserted. Staunchly defending the President, the former Defence Secretary also criticised anti-graft agencies for filing cases against former armed forces commanders. “President Sirisena himself said that military personnel were being held in custody for 16 months. Does it take 16 months to conduct an investigation? Is that justice? Why aren’t the NGOs talking about that? Now everyone is opposing his speech. So are they saying he must do what they say? Doesn’t the President have the right to express how he feels?” Rajapaksa said in defence of Sirisena’s outburst. The endorsement from the former Defence Secretary came amidst a storm of controversy over President Sirisena’s remarks which were roundly criticised by the JVP and civil society movements that heavily backed his candidature in the January 2015 election. President Sirisena’s speech before an audience primarily comprising military officials also exposed a major faultline within the ruling coalition, because it was perceived as being directed at his alliance partner, the UNP, and alluded to the party’s alleged hold over the anti-corruption bodies. A meeting between President Sirisena and Prime Minister Ranil Wickremesinghe took place at 5.30 PM on Thursday. Daily FT learns that the meeting between the President and Prime Minister had been amicable, despite the prevailing tension. The two leaders had resolved to iron out their issues, aides said, speaking confidentially. The President’s speech on Wednesday had taken the Premier by surprise, highly placed sources said. Wickremesinghe held talks with senior officials and a party MP ahead of his meeting with the President on Thursday to discuss the major tension points within the ruling coalition that may have led to Sirisena’s outburst. Adding a strange twist to the prevailing political drama, actor politician and Deputy Minister Ranjan Ramanayake reportedly played mediator during the crisis, to convince both President Sirisena and Prime Minister Wickremesinghe that the alliance had to be safeguarded at all costs. Ramanayake, often known as ‘One Shot’ after a character in his films, briefed the Prime Minister for one hour about the corruption allegations against members of the ruling coalition. Ramanayake emphasised that the presence of former Central Bank Governor on prime ministerial delegations was hugely problematic and said the lack of action against certain powerful businessmen allegedly involved in corruption during the tenure of the Rajapaksa Government was eroding the Yahapalanaya administration’s credibility. All these things could be irking the President, Ramanayake explained. Highly placed sources told Daily FT that Ramanayake who is also a confidant of President Sirisena, had communicated to Wickremesinghe that the source of President Sirisena’s anger was recent actions by the Bribery Commission against SLFP Ministers A. H. M. Fowzie and Priyankara Jayaratne on relatively minor allegations, which he viewed as a witch-hunt against members of his own party, while corruption probes against certain members of the former regime faced continuous delays. The President was also incensed by the continued disruptions to investigations into the alleged Treasury Bond scandal during the tenure of former Central Bank Governor Arjuna Mahendran, the sources said. President Sirisena had also assured confidants on Thursday that he had no intention of allying with the members of the Rajapaksa regime to scuttle Wickremesinghe’s UNF led administration. Both main parties in the ruling alliance – the UNP and the SLFP – called off media briefings scheduled for Thursday, to avoid facing the press. As the fallout from President Sirisena’s speech continued, the SLFP also cancelled a press briefing scheduled yesterday. The President’s criticism of corruption investigating bodies has drawn a sharp response from civil society representatives, who held a media briefing yesterday to condemn the remarks and attempts to demoralise the Bribery Commission and Police. “The whole country is shaken by these statements,” Ratnapriya charged, adding that President Sirisena’s remarks seemed to be a throwback to the Rajapaksa era. He urged President Sirisena to ‘go back and read the Yahapalanaya manifesto”. Ratnapriya said the Purawesi Balaya was expressing “disgust” and condemnation of the President’s remarks. Prof. Sarath Wijesooriya who is also a co-convenor of the powerful civil society group, said that in a mark of protest against the President’s speech, artistes attached to the civil society movement would boycott a meeting for artistes President Sirisena had convened last evening (14). “We stand with the officials investigating these corruption cases,” Prof. Wijesooriya asserted. Co-convenor of Purawesi Balaya and senior academic Dr. Gamini Viyangoda noted that it was also important to observe the tone of the President’s statements on Wednesday. “Even his mood during that speech showed the country that he was opposing corrupt individuals being brought before the law,” Dr Viyangoda noted. “Why do we need independent commissions if the President must be told every time someone is going to be taken to court? What kind of independence is that? Is that what the 19th Amendment brought about?” he added. Purawesi Balaya and partner groups played a major role in mobilising support for President Sirisena’s candidacy in the January 2015 presidential election.